Debt can put a lot of stress on a marriage, let alone a single person to take the entire weight on your shoulders, so it is best to start now to eliminate debt this upcoming year. With the long-term goal of having money available to live a quality life in retirement without counting pennies, now is the time to get out debt completely and free up money to contribute to your emergency fund, savings, and retirement account to grow. 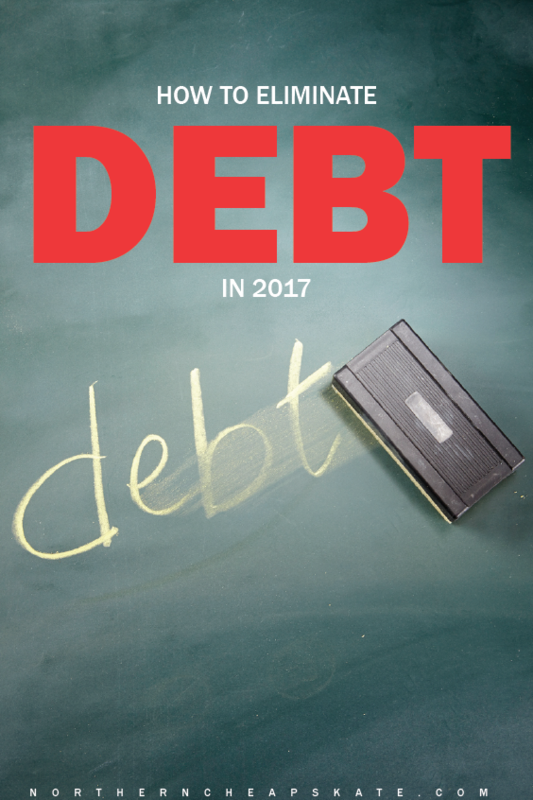 There are plenty of ways to start attacking debt right now to get ahead in 2017. If you are in the unfortunate position that you are carrying over a debt balance over each month and continuing to pay interest, you will need a way out quick to avoid wasting money away. Since your interest rate is probably north of 10%, it may make sense to check another card you have on any balance transfer options, or even applying for a new one. Although there may be a fee for transferring the balance, the 0% promo interest rate over the next year savings could far exceed money spent on interesting, paying the principal down much more than you would have otherwise. There are a couple ways you can go with this one, depending on the balance, interest rate, and a sense of accomplishment you want to give yourself. To avoid the most spent on interest, it would be wise to pay off the card with the highest interest rate first. On the statement balance aspect, paying off the highest balance first could put a huge dent into your outstanding debt, while paying off a card with a little balance could be motivating as you see that zero balance show up on the next statement, prompting you to move onto the next. It is easy to create a budget, but is extremely difficult to stick to a working budget. First you will need to take note of every dollar coming in, how much in necessary monthly expenses such as the mortgage, loans, and utility bills. You will need to figure out how much to have available for food and gas, contributing to savings & retirement accounts, while still having money left over to use to pay down debt. It will take some tweaking along the way to make sure it is efficient, but a budget, although requires patience and extreme discipline, can successfully get your household on track to get out of debt. There will be necessary expenses accounted for in your budget, but if you do not keep the spending until control, the budget is doomed for failure. It may actually help to take the full account statement from debit/credit accounts to see all of the charges made in a month and go line by line to see if they were needed or not. Work together with your household to ensure everyone is on the same page in the reduction of expenses. You will probably be surprised at all of the takeout and eating out at restaurants, as those costs can quickly add up. Be sure to utilize a grocery budget and eat at home more. If you are sticking to a budget but are just not finding the additional funds needed to pay more towards getting out of debt, then you may have to earn additional income. Holiday work, waiting tables, or part-time retail may be the way to go to work a few extra hours that can go all towards paying down a credit card balance. You can also look around the house for items that are sitting around that you can use in a garage sell, sell on eBay/Craigslist, or donate to charity and gain a tax write-off when it comes to tax time. If you are too far behind or find yourself not able to come up with and stick to a plan on your own, then it may be time to seek help. If you don’t mind sharing with loved ones, you could first enlist the help or a responsible friend or family member that either does this professionally, or could just be used to motivation to stay focused. If debt is out of control, you could search for a credit counselor that will work with you on a plan or repaying, and even working with creditors to try and reduce the balance or interest while you are repaying.